The employees who survived were taken to the University of Maryland Medical Center’s Shock Trauma Center and were in critical condition, said Jeffrey R. Gahler, the sheriff in Harford County, Md. The people killed were identified as Bayarsaikhan Tudev, 53; Jose Hidalgo Romero, 34; and Enis Mrvoljak, 48. 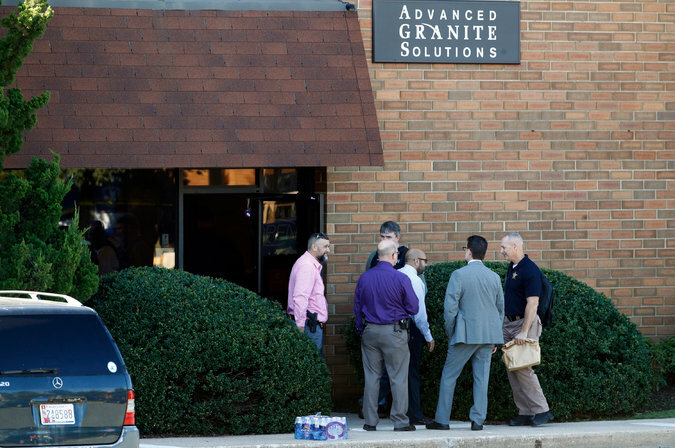 The owner of Advanced Granite Solutions, Burak Caba, said in a brief phone interview on Wednesday night that he was shaken and did not want to discuss what had happened. Mr. Caba told The Associated Press that Mr. Prince worked as a machine operator at the business, which designs and installs granite and marble countertops. Mr. Prince was fired from another Maryland granite business this year after he had been accused of punching a co-worker in the face, according to Maryland court records. The first 911 call came into dispatchers at the Harford County Sheriff’s Office at 8:58 a.m., the sheriff said, and officers responded to the scene within four minutes. But by then Mr. Prince had left, apparently on his way in a GMC Acadia sport utility vehicle to Delaware to confront a former colleague, the authorities said. “There’s an individual out there on the loose who committed one of the most heinous acts we’ve ever seen in our county,” Sheriff Gahler said at a news conference on Wednesday morning. The scene after a workplace shooting in Harford County, Md., on Wednesday. About 10:45 a.m., Mr. Prince pulled into the 28th Street Auto Sales, a used car dealership in an industrial section of Wilmington, Del. He shot a man twice, including once in the head, the police said. He was being treated at a hospital, the authorities said. The man was conscious when officers arrived and identified the gunman as Mr. Prince, Robert Tracy, the Wilmington Police Department chief, said at a news conference. Mr. Tracy said officers spotted a GMC Acadia leaving the dealership and chased after it, but the driver got away. David McCall, a cook at the Printz Market, a convenience store next to 28th Street Auto Sales, said he recognized a photo of Mr. Prince on the news as a former employee at the dealership. Mr. McCall said that he often got upset at his store and yelled at employees.